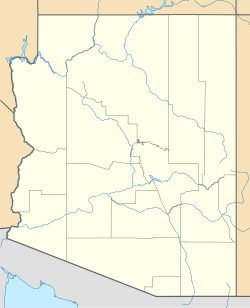 Saint Anthony's Church and Rectory is a Roman Catholic religious complex on Picacho Street in Casa Grande, Arizona. It was listed in the National Register of Historic Places in 1985. The church is built of adobe covered with stucco and has Spanish Colonial Revival influence. It was built in 1935. The north corner of its front facade has a bell tower surmounted by a small cross. The rectory was built in 1936, and also is of Spanish Colonial Revival influence. Its interior has a large 16 by 31 feet (4.9 m × 9.4 m) open beamed ceiling. The church or the rectory is also known as Murphy Hall. ^ a b c Janus Associates Inc. (September 1982). "Arizona State Historic Property Inventory: Saint Anthony's Church and Rectory / Murphy Hall". National Park Service. Retrieved March 20, 2018. This article about a church or other Christian place of worship in Arizona is a stub. You can help Wikipedia by expanding it. This page was last edited on 20 March 2018, at 21:41 (UTC).